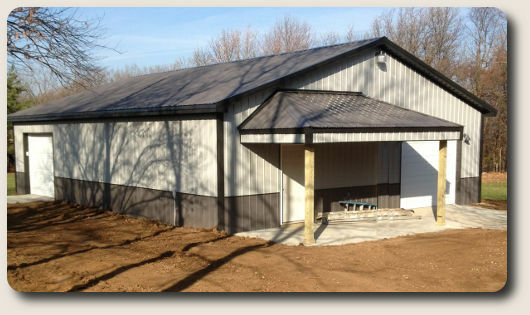 Our design center can price any size garage for you with full length eave side porches. You can customize window and door locations, add cupola, eave lite panels and change colors to get the right look for your property. We offer custom quotations for turnkey erection including concrete slabs or wood flooring. Pole barns can be built on grade to save money and the slab can be added later when your budget permits. Customization not possible online is available for custom quotation, including gable porches, entry way porches, attic trusses and gambrel, monitor, and other roof systems. For a quotation just complete a design online, save it and email the quote number to us. We will provide an installed price in 24 hours or less typically. Steel panels come in 22 colors. All packages include detailed building plans, a how-to guide and free technical support.